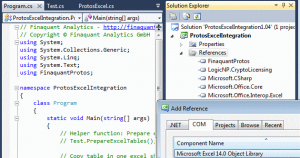 This article explains how the table functions of the non-commercial .net library finaquant® protos can be called from within Microsoft Excel using VBA macros. Once called from a macro, the .net method reads the input tables from the given excel worksheets before executing the table functions to obtain output tables. The output tables are in turn written into the desired excel sheets. Note that names of the worksheets are passed from the macro to the .net method as parameters for selecting the input tables. Each worksheet contains a single input table. 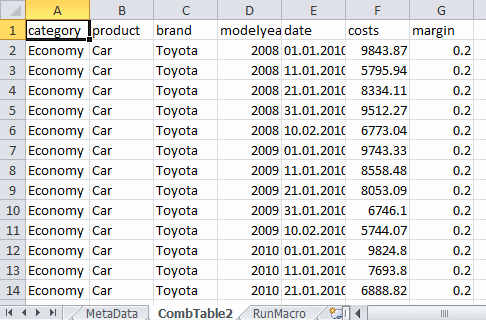 … which reads input tables from the given excel file before making the required table calculations. 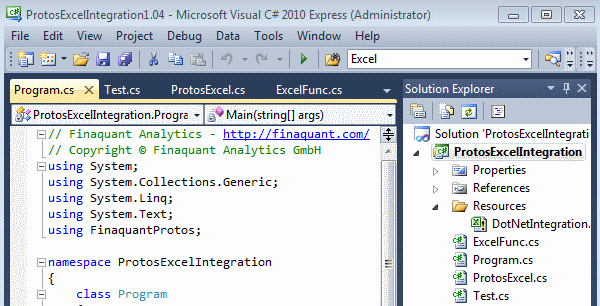 All the example codes above and others can be found in MS Visual Studio File ProtosExcelIntegration	(836 downloads) . Install the latest release of the non-commercial .net library finaquant® protos on your computer. Ensure that the proper ODBC driver is installed on your computer. See related article for more information. 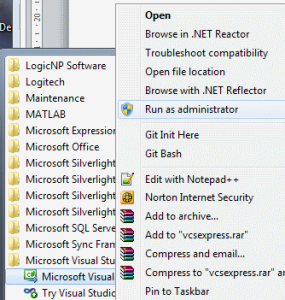 Open the VS file ProtosExcelIntegration as administrator: Find the application (Visual Studio) in program starter menu, right mouse-click and select Run as administrator. 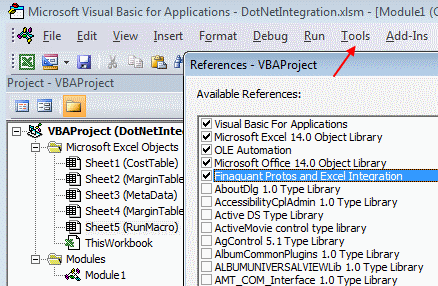 Ensure that Microsoft Office and Excel Object libraries are referenced by the VS project. You need to update references if you have a Microsoft Office version other than 2010. Build (or rebuild) the VS project. This integration option is particularly useful for demonstrations: Users can first enter the calculation parameters (like sheet names for selecting the input tables here) and execute their table calculation by just pressing a button. Open the VS file ProtosExcelIntegration as normal user; you don’t need to open it as administrator. 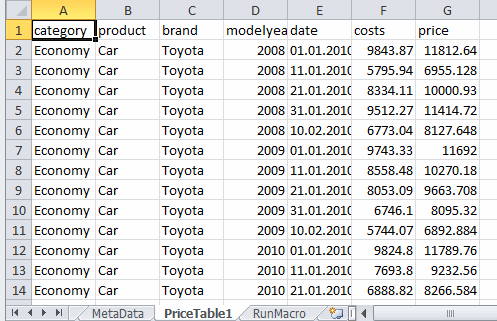 This entry was posted in Calculation engine and tagged .net library, excel, integration, table functions. Bookmark the permalink. Calculation engine with multiple calculation instances is designed to work with a relational database, right? Can it also work with an excel file?